The Perfect Date. These three words could mean something completely different to you than they do to me. Perhaps a walk along the beach after a nice candelit dinner, or skydiving for your first time, or maybe even a wild jungle adventure. Maybe your preference is to be the mastermind behind planning this perfect adventure for yourself and your date, or on the receiving end. Whatever your position may be, all you know is that it has to be “perfect”. When previously asked what my idea of the “perfect date” would be – I could never seem to come up with any form of unique answer besides dinner and a show or some drinks at an elegant lounge of sorts. I assume I just don’t seem to have that type of creativity within me. However, whenever I see a date on a movie or hear about one that really stands out to me through a friend of mine I am always so excited with envy for them. How come I can’t have a fun, spontaneous, unique date? And also I assumed if I didn’t plan it myself it would never happen – and what is the fun in that? 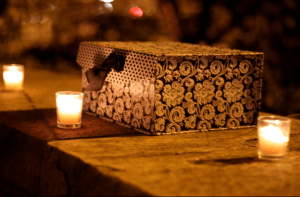 In my case, I wasn’t the planner or the recipient – neither of us was! I mean, I definitely participated in the planning process, but only to a certain extent. I’m not going to lie, I definitely love being wined and dined – it’s the “Diva/Princess” in me (or maybe just a bit old fashioned, to be honest), what woman doesn’t? However, I also thoroughly enjoy making someone else smile. There is something so ultimately satisfying when you decide to do something sweet for that special person in your life and their sincerest appreciation is expressed through their smile and reactions during the course of the evening. It could be a small or grand gesture – whatever it is, the more thought you put into it the special it is going to be. I was browsing the Internet one evening, as usual, and came across a brilliantly unique service provided in the heart of our beautiful city. The name “The Perfect Date” appeared on my screen and intrigued me. I quickly came to the conclusion that it was just another ‘dating’ service. As my ‘research’ continued, I found a page that impressed me. Three different package options for this company to create the “Perfect Date” for you. I immediately thought of all the many men in this world who could use a service like this. No offence fellas, but us women are just dying for you to be creative and spontaneous for us and if you can’t do it on your own then why not have a little bit of help? Or maybe you’re just too damn busy in this fast-paced world we live in to sit there and brainstorm and then have to arrange everything on your own. This is just another luxury service offered to you, you hard working man you. Afterall, you deserve the convenience – you’ve worked hard for it! Okay, okay enough of my witty banter, let’s get back on track here. 3) Premium: Custom itinerary for 3-stage date, 1hr planning session (in person or phone), managed reservations, 1hr personal shopping or wardrobe selection. 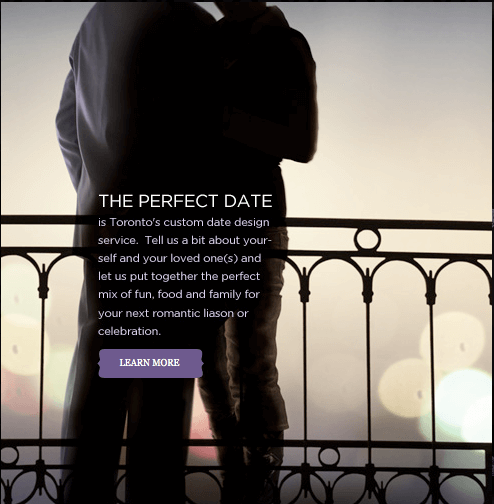 On this particular summer day in mid-June I decided to contact Elitsa Manolo, Owner and Founder of The Perfect Date, to get a little bit more information on her services. After a couple of brief emails back and forth I decided to be spontaneous and went for option three. This was going to be so much fun! I was definitely excited and couldn’t wait to arrange an evening to surprise my date. Through the exchange of emails with Elitsa I learned that her main objective at The Perfect Date is to constantly explore Toronto to find all of those hidden gems that nobody would even think of visiting and arrange an unforgettable evening. When I asked Elitsa who the majority of her clientele was her answer was men who want to romance their women – how sweet. My assumption was correct! Depending on which package you choose, you will set your date up with the date specialist either on the phone or in person. A questionnaire is then presented to you. The category of this questionnaire depends on the type of date that you hope to have. 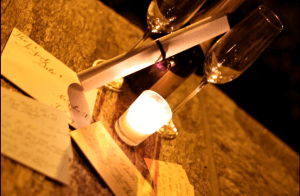 Everything at The Perfect Date is specialized to you and your date for your special evening together. After the questionnaire is completed, the team sits down to analyze and provides a selection of activities for you to choose from. Each and every package supplies you with a number of selections for your date. This is very micromanaged to ensure it is in fact perfect. 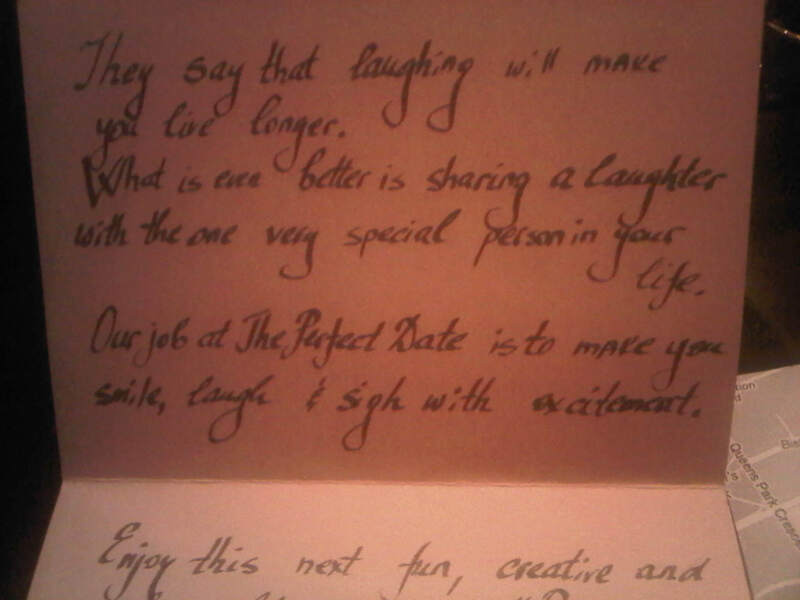 The team at The Perfect Date completely cater to their clients individual interests, demands, wants and needs. The founder, Elitsa Manolo, is a very romantic woman and LOVES to plan proposals. Up until recently, the majority of dates planned through her company were for a proposal. I had asked if a request for anything extreme has been made but up until now the majority of them have been basic and romantic. Their premium packages is catered towards someone with a bigger budget who is looking to spend, however, don’t get discouraged so quickly as there is something for everyone! 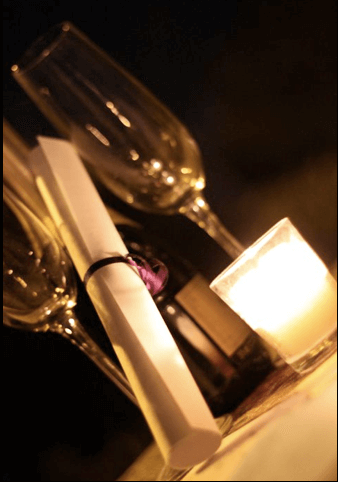 If you’re on a smaller budget there will always be something that the team at The Perfect Date can help you out with to ensure your evening is as romantic and unforgettable as ever. For me, we started with the questionnaire. Names, birth dates, favourite colours, hobbies/interests, preferred genre of music, favourite car, any allergies, favourite type of food, favourite vacation spots, go-to spots in Toronto, first thing I notice about my date when I look at him, etc. Final question” What would you consider the perfect date” and she gave me an option of four to choose from . She gave me a quick idea of what her thoughts were and also asked if I preferred spontaneous – which she loves the most – or something that is planned out and I have the complete itinerary to surprise my date with. 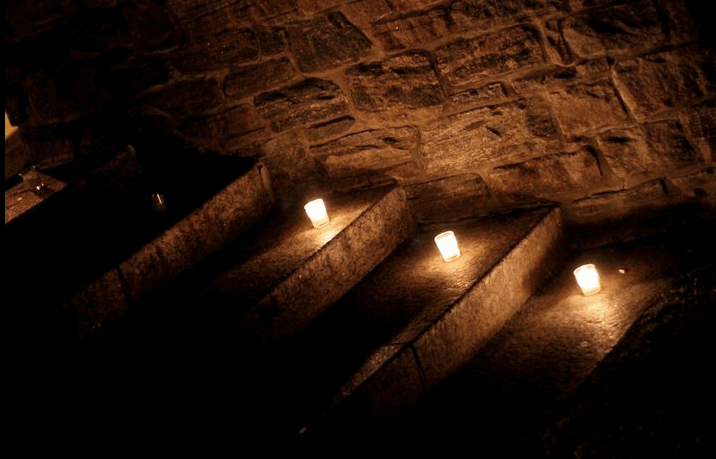 I chose spontaneity – I love surprises! She told me how for her boyfriends birthday she sent him on a four hour hunt for his gift to all different places around the city with different envelopes bringing him right down memory lane from their first kiss to their first date etc. She is all about the little things. How adorable! I wanted something this FUN. Now to the best part – my date! I couldn’t have been more excited to participate in this spontaneous evening. The morning of Elitsa sent me an email confirming that the date was still on as she had already made arrangements for our three-step date. My date and I had been looking forward this particular Wednesday for a couple of weeks so I messaged back quickly with overwhelming excitement expressing how much I was looking forward to the evening she had planned for us. The best part out of all of this is that after the questionnaire I didn’t have to do a single thing myself. After all of the hustle and bustle of both of our busy lives we simply showed up and Elitsa took care of everything. In the initial email of the day was the address of our first destination. I couldn’t help but wonder where she was sending us but I decided not to be a total nerd and spoil my own surprise by googling the address. Trust me, this took a lot of will power. So everything is set for you special date tonight. I am getting really excited. Go inside and tell them that you have a reservation for 6pm – it is under your name and is made by Elitsa from The Perfect Date – they will know! Dress code for the night: however you want – just keep in mind no black tie and gowns needed. It is more semi formal. The one thing you need to definitely have with you is a jacket or any type of over coat. You will get your next clue in the Restaurant. Hope you enjoy your dinner. At the second location – you need to be there by no later than 7:45 and it is about 15 minutes away from the restaurant by car. There are no assigned seats – so if you are there a bit earlier you would have a good chance of getting better seats. I have already bought the tickets for you – so all you need to do is go to the box office and tell them that you are Natasha J, they will know you are coming. 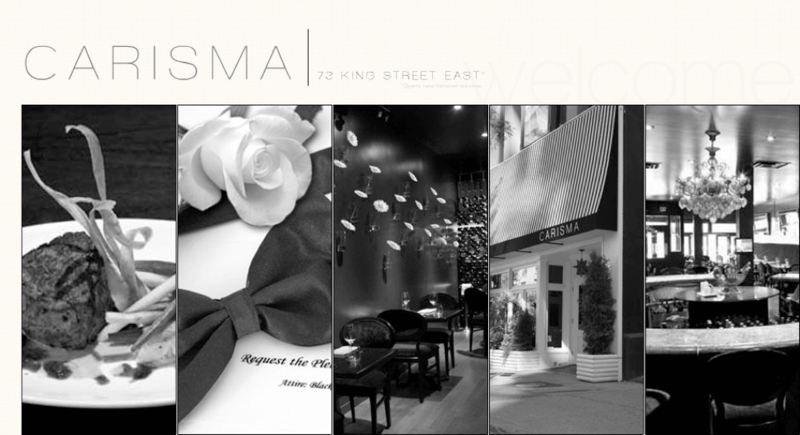 We parked and showed up at 6pm to Carisma on 73 King Street East (which was very early for us as we are 8pm and on dinner type of people) to ensure we had time for dinner and drinks before our second destination. I gave them my name and noticed on the reservation book that it said “Best table*” next to my name – I loved that. We were then escorted to our beautiful candle lit corner table where the waiter brought water to us immediately. The staff at the restaurant was extremely polite, professional and punctual. The three p’s I look for when it comes to service. Check, check and check! Almost immediately the manager came up to us and introduced herself and then handed our very first envelope. Yay! I was so excited. We were very tempted to open it right away but I kept it a surprise as promised and waited until the end of the meal to unfold the hints to our next destination. Carisma is such a beautiful little hidden gem. Ironically, I had driven past only a few days prior expressing to my friend who was in the car with me how I was looking forward to checking it out. The menu is Italian inspired. It is quaint, romantic, quiet, and sophisticated. Our waiter was extremely efficient and helpful – especially when it came to selecting the perfect glass of red to compliment our dishes; he brought over my top three choices for me to try. The food was presented very well and it was delicious! 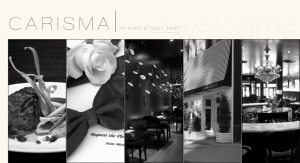 We were so excited to finish our meals and open the envelope but that didn’t spoil the experience at Carisma, we had a fantastic time and I would definitely return. As we took the last sip of our espresso martini I pulled out the envelope to unveil what the rest of our evening had in store for us. 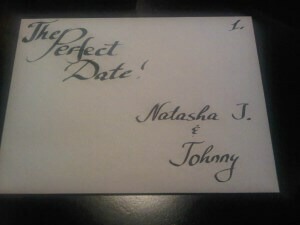 I opened the envelope to find an adorable little card with my date and I’s names on it. “They say that laughing will make you live longer. What is even better is sharing laughter with the one very special person in your life. 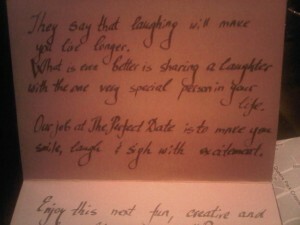 Our job at The Perfect Date” is to make you smile, laugh & sigh with excitement. 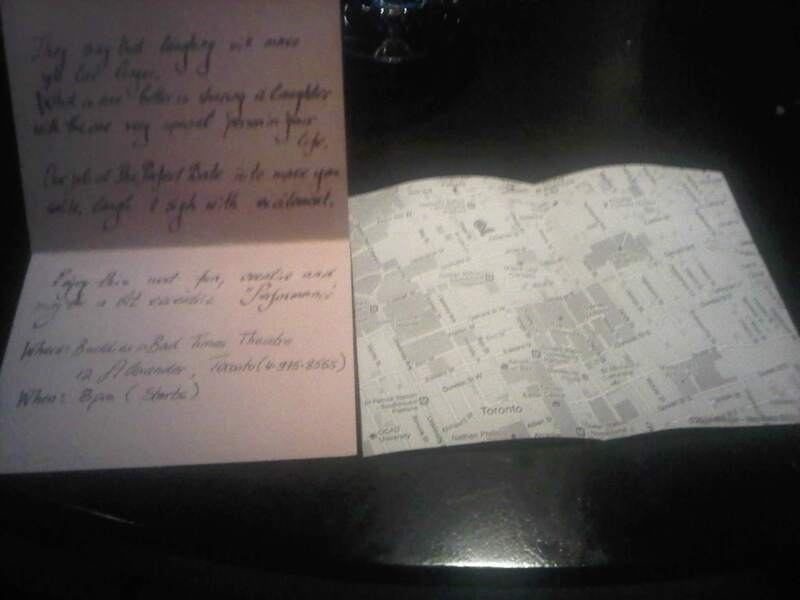 The card also contained a printed out map to ensure we didn’t get lost. How helpful! Our excitement continued to grow. It was 7:35 and time to pay the bill and move along to our second destination. The evening immediately turned into this exciting, mysterious adventure that had us on the edge of our seat the entire time. A typical date with two indecisive individuals like us consists of dinner (after asking each other what we felt like that evening and a few “I don’t know I don’t care’s”) and then trying to figure out where to have some more cocktails after. Our itinerary is never this full and exciting. Shortly thereafter we arrived at Buddies in Bad Times Theatre. A hidden little artistic theatre just east of Yonge St. in the village area that I had probably passed more than a handful of times and never took note of. I thought to myself, “this is going to be interesting”, especially considering it was during Pride week. We headed straight to the box office and as promised, I was handed another envelope with my name on it and two tickets. I absolutely love the arts and especially live performances. My date is also an extremely easygoing person so I was sure we would enjoy ourselves, no matter what. We walked and noticed the bar right away. As we lined up to get a drink to enjoy the performance with I noticed that it was a full house. We quickly accepted our surprisingly inexpensive cocktails and headed to the second floor where a very kind gentleman moved over to make room for two seats by the wall for us. The both of us smiled in anticipation and excitement – I was so tempted to open the second envelope and then the lights began to dim. The show “Viva Cabaret – starring Yuri” was starting! The show was designed quite simply. A stage, a piano player, and two male back-up dancers. Yuri came onto the stage, in drag, and began to steal the show with a little Liza Minnelli impersonation. Viva Cabaret starring Yuri aka Yura the principal performer is an incredibly passionate performance combining high-energy music, dance, comedy, drag, quotes and poetry in one. 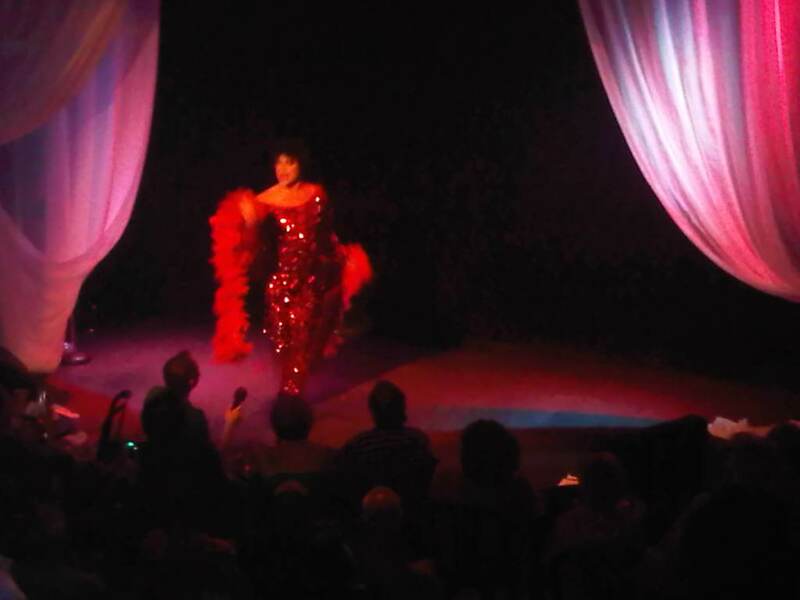 The show is a tribute to the greatest divas, past and present all the way from Hollywood, Broadway, and The Opera. Yura instantly evolves into 20 different characters between sets with only a 15 minute intermission. The two of us were wildly entertained. We were laughing alongside the people around us, smiling with all of the positive energy and impressed by how fantastic the performance was. Bravo Yuri! A few drinks later the show came to an end. What a unique and incredibly entertaining performance. We shared a few moments of the performance that stood out to us and made us laugh, finished our drink and opened envelope number two. We also know that romance goes hand in hand with intimacy. And what can be a more intimate set up than bringing nature, boats, a gazebo, the moon and the stars to all come together for the perfect finish of a Perfect Date! Again, Elitsa had provided a printed map for us to follow. Where the heck was this place? I noticed it was on Queens Quay West, which would explain the boats, but I thought I was going for dessert? Slightly confused we made our way to the third destination. Our level of anticipation for this one combined with the excitement that was still lingering from the performance we had just experienced was evident. We found parking and continued on our adventure. The unit number of the address that was provided was an odd number and all of the units along the north side of Queens Quay West were even. Did she make a mistake? We walked up to the café we assumed we were having dessert only to find that it was closed. Getting a little discouraged at this point in time we decided to cross the street and see if there was some hidden café along the harbourfront we didn’t know about. As soon as we walked up a few steps both of our eyes lit up. There in the middle of the harbourfront, underneath a gazebo, were tiny candles acting as “arrows” leading up to our final destination. We walked a bit further to notice Elitsa standing there greeting us with a warm smile. Beyond her was a box with chocolates, a small champagne bottle with two champagne glasses, another envelope (of course) a rolled up paper and a few que cards. This was unbelievably romantic and so incredibly unique. Elitsa had set up candles all over the gazebo, going up and down the steps that lead up to it in different spots and all over the seat our cards rested on. I was almost at loss for words, which clearly is unusual, and immediately went over to give Elitsa a hug and two kisses on the cheek and began to express how wonderful our evening had been up until then. She let us get back to our little treasure hunt and told us not to mind her. As we went to open up envelope number three, she was snapping pictures to make memories of this beautiful evening under the stars for us. I’m someone who loves pictures so this was such a treat. As I proceeded to open enevelope number three, my date poured us each a glass of champagne and we were just glowing with happiness. This truly was such a special evening. “We go about making memories every day but we often fial to remember them. It is important to take the time, every now and then, and remind each other of all those small occasions and moments worth keeping in mind. I then unraveled the piece of paper that congratulated us on the final step to our Perfect Date. It instructed us to remove the que cards from the box, the pink ones for him and the blue ones for myself, and to answer them honestly. For us, this was very simple as we’re very open with each other and communicate very often, but this would be ideal for someone who is curious as to how their special person feels about them. After finishing our glass of champagne and chocolates, we took a moment to take in the entire evening and then spoke to Elitsa a bit more before thanking her multiple times and calling it a night. When Elitsa told me that she wanted to influence bringing more romanticism into Toronto, similar to how romantic New York is said to be. I couldn’t agree with her more. The evening she planned out for us was not only romantic, but exciting and definitely one the both of us will always remember. I have, and will continue to recommend her service to try at least once to those who are newly dating, dating for years or even married with children. Elitsa will plan your entire evening for you, even as far as hiring a trusted babysitter for that evening. You can feel confidant in leaving the planning process to your Perfect Date up to her. I know I was glad I did. 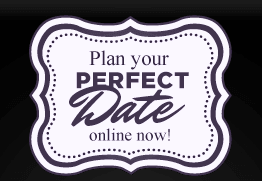 PLEASE visit http://www.theperfectdate.biz/ and check out the many options of this Romantic Event Planning service located in Toronto. I love your producing type, do keep on creating! I’ll be back!